If you like a little extra garnish on your Mercedes S Class or E Class AMG, Brabus has a new kit that just does that. It adds new aerodynamic bits and pieces and which make the car more efficient in that aspect and also look very cool. There is a new front spoiler, bigger than previous versions, new side skirts, new designs for rear diffuser and boot lid wings, as well as new tail pipes in oval or rectangular shape. Exhaust systems, monoblovk wheels and suspension upgrade are offered as before. The BRABUS designers have modeled a front spoiler lip that attaches to the lower part of the AMG front apron on the sedans and wagons of the latest E-Class. Its sophisticated shape further reduces lift on the front axle for further improved directional stability. For the sedan there is also a diffuser and rear spoiler that is mounted on the trunk lid. The former features a centrally located reflector, and stylishly blends with the rear bumper. It has cutouts on either side for the tailpipes of the production exhaust or of the BRABUS quad sport exhaust system. Like the front spoiler the components for the rear are manufactured in OEM quality from Pur-R-Rim plastic ensuring perfect fit and excellent paintability, both in body or in contrasting color. BRABUS also offers these components with a titanium-colored paint finish. The Mercedes S-Class with AMG styling also gets a more athletic appearance with additional BRABUS body components that are manufactured in OEM quality from Pur-R-Rim as well. The BRABUS aerodynamic-enhancement kit can be painted in body color or come with a glossy titanium paint finish. 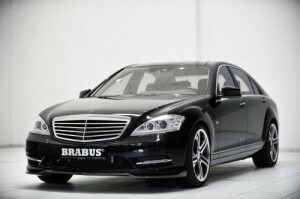 The BRABUS front spoiler improves the aerodynamic properties of the luxury sedan. As a result, the car delivers an even smoother ride, particularly at high speeds. The rear spoiler and diffuser, which also features a centrally located reflector, also contribute to even better high-speed handling. A BRABUS aero update is also available for the E 63 AMG. To further optimize directional stability at high speeds, the BRABUS designers have developed a carbon-fiber front spoiler lip that attaches to the production bumper of the E 63 sedan or wagon. Custom-tailored air ducts from BRABUS lend the side outlets of the AMG apron even more sporty profile. Also made from super-light composite material are the BRABUS rear spoiler lip and the diffuser insert, which are both reserved for the sedan. The rear appearance of this model is characterized by the visual trademark of BRABUS, the centrally located reflector. But that’s not all: the diffuser provides the perfect backdrop for the ceramics-coated dual design tailpipes of the BRABUS stainless-steel high-performance exhaust system. Thrilling looks are not the only strengths of the sport exhaust. An integrated flap system lets the driver choose between a discrete ‘coming home’ mode and the sport setting that provides an even more exciting exhaust note, all at the push of a button in the cockpit. The S 63 can be refined in a similar manner: an additional front spoiler made from Formula 1 material of choice carbon fiber for the AMG bumper was modeled for it as well. It benefits the car’s appearance and handling characteristics at high speed. In addition to the spoiler lip for the trunk lid there is also a center diffuser with reflector for this model. Also in the product program: the stainless-steel BRABUS flap control exhaust system. It features cast-aluminum ceramics-coated tailpipes and a variable exhaust note controlled from the steering wheel that spans the gap from Dr. Jekyll to Mr. Hyde. The BRABUS program naturally also offers countless additional options for customizing all AMG models. These include custom-tailored BRABUS Monoblock wheels with diameters of up to 20 inches, depending on the model in question. BRABUS front sport fenders, available for all E- and S-Class models, are yet another visual delicacy. BRABUS wouldn’t be BRABUS if it didn’t offer engine tuning for the various AMG engines. Highlights in this category are the 6.3-liter V8 fast-revving engine and the new 5.5-liter V8 Biturbo engine. The interior also offers a wide open playing field for refinement. The BRABUS upholstery shop uses supple leather and Alcantara to adapt the interior to the customer’s personal preferences down to the last detail. Other instruments of cockpit refinement are carbon-fiber and exotic wood trim elements available in any desired color and in a number of different designs.